Now upgraded! 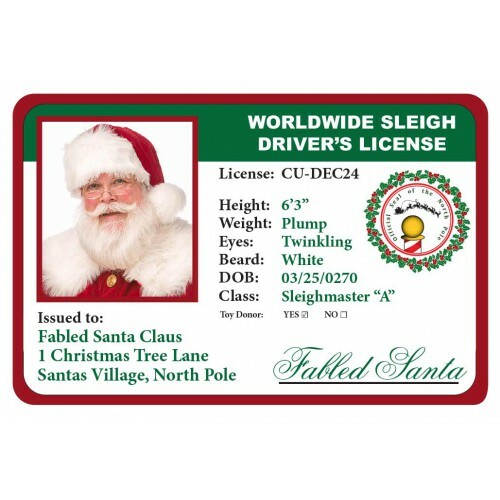 Printed on high quality, durable PVC card stock. 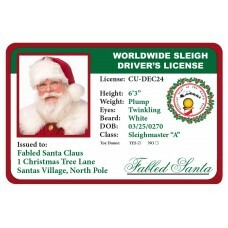 Why not order your custom Santa's Sleigh License from ToysForSanta.com? You may place your order and then simply reply to your confirmation email with your preferred JPG image (please - 250x250px, 300 dpi minimum requirements) and we'll add it to our license layout. 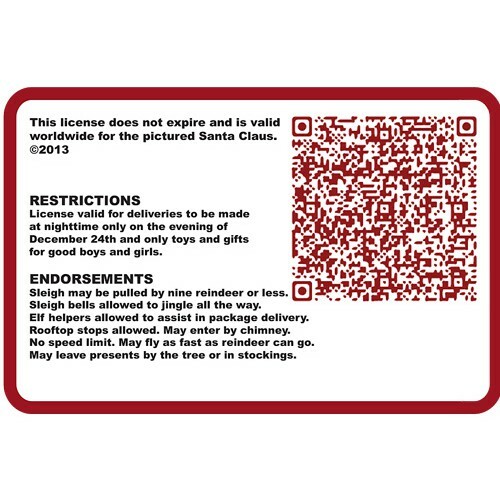 Also, please include any other descriptive factors that you'd like us to use, including the Santa name you want, details on your height, any special address and your Santa contact inforrmation if you wish us to use a custom QR code on the reverse side (optional). We will email you a low-res proof image and then, upon approval, produce the identification card on our new, 300DPI 30mil ID PVC card printer, just like a real license. NOTE: As an alternative to a separate email, you may use our License Data Submission Form. Click HERE. Please allow us 3-5 working days to produce this custom made product to your specifications.